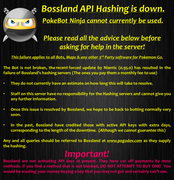 I want to know the status of Pokebot.ninja, just i want to use the bot but i don't know if are enable. yeah i have the same question, im looking here on the forum if i can find something says about the status but i didnt! The best place to get quick answers is to join our Discord server, the link is in my signature! Hi, i really want to use the bot but in store it says that none API's are currently avaiable to buy using credit card or paypal so where i suppose to get/buy them from?